Usually 1G is the easiest and 6G the hardest.My own coding are in MIG and MMA(stick), Mid steel plate in the vertical up position. The hardest joint is usually the inclined plane pipe to pipe weld. The term "Coded Welding", ''Code Welding'' or "Welding Codes" means that the person who says he or she is a "coded welder" has taken an exam in a welding process using a certain method. (Welder Approval Test)Think of it as a bit like learning to be a pilot. Once you have qualified as a pilot you then have to take type approval tests to be able to fly different types of aeroplane. 1.Process. 2.Material. 3.Thickness. 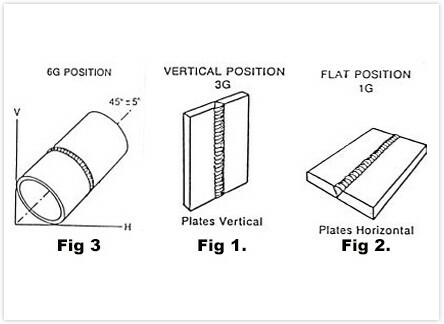 4.Type of joint.5.Position (Difficulty). Usually 1G is the easiest and 6G the hardest. My own coding are in MIG and MMA(stick), Mid steel plate in the vertical up position. Usually, the simpler joints are easier to master and as you progress up the ladder, the trickier joints will allow you to be coded in the easier joints automatically so try and get coded in the higher levels if you can. The hardest joint is usually the inclined plane pipe to pipe weld. This will usually cover all the easier joints as well. The ASME IX (pronounced as "asmey nine") is the American qualification and usually applies to an inclined pipe joint. The BS 4872 is as the name suggests is the British Standards qualification and usually refers to plate work or beam welding joints in the construction industry. I regularly get asked how to achieve the coding to allow a person to go off shore and work on oil rigs etc. If you would like to work out on oil rigs you will have to start off "learning to walk before you can run." You will usually need BS EN 287-1 (now EN ISO 9606-1) or ASME IX to work off shore and usually in "stick" welding. Don't be put off though as you can learn to stick weld quite quickly and achieve good results. Learn to stick weld first rather than MIG weld as the "MIG" welder is usually shore based in a fabrication workshop. The nature of stick welding lends it's self to off shore work as it is far more versatile in an environment out at sea. MIG welding relies on the principle that the welded joint is shielded by a gas which tends to be blown away in windy conditions. Once you have got the hang of stick welding you could try and get a job in a workshop and improve your skills,branching into MIG welding as an extra. It's much easier to get time and experience once you are "on the inside". Employers are usually keen for their staff to improve themselves and might let you have one day per week attending a college on a welding course. As in any trade, there is no substitute for experience. You can learn so much more if you are working within the trade rather than just attending a training course. Work colleagues are usually very keen so show you their tips and techniques so pick their brains at every opportunity. You will soon be knocking out welds as good as them! This is the stage you might want to consider starting to train towards a coding. Some larger companies may have "in house" training courses so seek them out and get all the training you can. Their welder training will probably be conducted by "real" welders on the shop floor who have had a lifetime of practical skill and experience. They can teach things that your average college welding teacher doesn't even know about. Although MIG coding is useful, try to get stick welding coding if you can as this is required off shore. All rights reserved by Hanzo Technologies Co., Ltd.